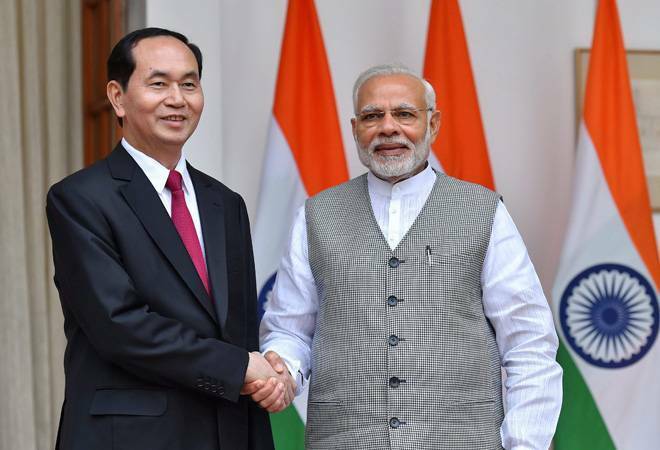 Vietnamese President Tran Dai Quang said India will emerge as the top trading partner of Vietnam soon and the target of USD 15 billion bilateral trade turnover by 2020 is feasible. He said India can become provider of inputs for the Vietnam's textile and footwear industry and his country also wants to enhance cooperation with India in tourism sector. "Currently, India is among top 10 trading partner of Vietnam. Soon, India will emerge as the top trade partner of Vietnam. "Our target of USD 15 billion bilateral trade by 2020 from USD 10 billion currently is feasible," the Vietnamese President said while addressing India-Viet Nam Business Forum organised by industry bodies CII, FICCI and Assocham. Tran said that with population size of 100 million, Vietnam is among the fastest growing economy and it is also safe destination of investment. Noting that Vietnam is growing at 6.5-7 per cent rate, he said, "India has always identified Vietnam as important part of its Act East policy". The president also pointed out that India and Vietnam has enjoyed long standing traditional friendship. The Vietnamese President is on three-day visit in India. Speaking at the same occasion, Minister of State for Defence Subhash Ramrao Bhamre said that our founding fathers have lead struggle against the colonialism. India admires bravery of Vietnamese people in their fight against colonial power, he added.